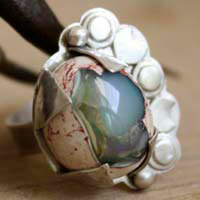 Its name comes from the Sanskrit "upala" meaning gem or precious stone. This would have given the Latin Opalus or the Greek word Opallios meaning "in order to see the changing color". Until 2007, opals were considered as minerals. It is actually a mix of crystobalite, trydimite and hydrated amorphous silica. The percentage of water in opals varies from 3 to 9% but some varieties can have up to 20%. Even if the composition of the opal is very similar to the one of quartz and other minerals with which it is compared, it is different because of its crystalline structure. The quality of opals can be checked by the purity of its crystals and therefore, by its capacity of showing iridescent reflections. There are two types of opals: the common opal and the noble one (a type of quartz that is very transparent). The first one does not show a variety of colors whereas the second one, yes. The variety of colors is due to the random arrangement of microscopic slates of tridymite or cristobalite spheres which are acting as a light diffraction. In Australia, aborigines would call it "the rainbow snake". According to the legend, the Creator would have taken the colors from the Rainbow and would have united them to make opals. According to another legend, the Creator used to walk on a rainbow path. Each step he would make would have become an opal. 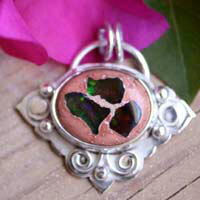 During the Antiquity, Greek people also had their own legends about opals. Zeus, the king of gods, would have been so happy after his victory over the Titans that his tears of joy would have become opals once on the floor. 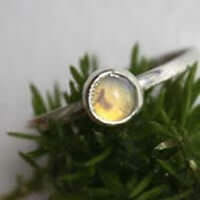 People thought that opals could give powers of seeing the future and a gift of prophecy to the owner of such a stone. Romans considered it as a sign of hope and purity. They are the first ones who organized the first opal markets. It is said that Marc Antoine fired a senator who would refuse to sell him an opal he wanted to offer to Cleopatra. This opal price is estimated at 60 000 Euros. In India, the legend is about a rainbow goddess. She was so beautiful that she was harassed by suitors. To escape them, she decided to transform herself in an opal. 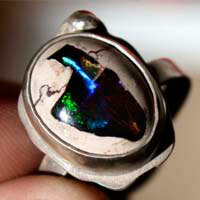 In the Arabian culture, it was thought that opals were born from thunderlights which would stay prisoners from the rock. 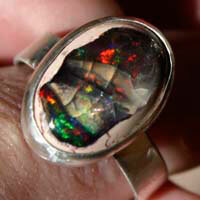 In North America, opals would have been mined for 10 000 years in the Virgin Valley. In Kenya, in a cave, the oldest objects known to this day were discovered. 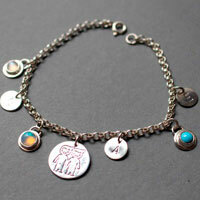 They would be decorated with opals dating from 4000 B.C. These stones would probably come from Ethiopia. During the Middle-Ages, opal was known as "ophthalmios" (the eye stone) because people thought this stone was good for the eyes. Blond women used to wear them on necklaces to avoid losing their hair color. Also, for a long time, it was thought that opals would bring bad luck. This was due to the Sir Walter Scott’s book, Anne de Geierstein or the mist girl, published in 1829. He tells the story of Lady Hermione who was accused of witchcraft. She dies after her opal received some drops of holy water. Shortly after this, the opal market dropped by 50%. The Olympic australis opal is the biggest and the most precious ever discovered. It is worth 2 500 000 dollars with 17 000 cts. It was named like this due to the Olympic games that took place in Melbourne the year it was discovered. It was preserved as a raw stone (not cut). The Fire of the Queen is maybe the most famous opal in the world. 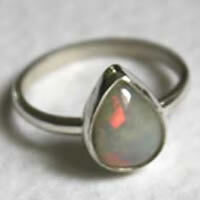 It is the most famous example of eye opals. The andamooka opal was presented to the Queen Elizabeth II in the 50s during her first trip to Australia. It is 203 cts. 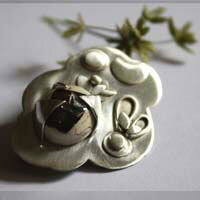 It is bezel set on a pendant surrounded by diamonds. Napoleon offered to his wife, the empress Joséphine de Beauharnais, the famous opal "burning of Troy", a stunning black opal. At that time, it was the most famous black opal with 700 cts. When she died, the opal disappeared and appeared again 100 years later when the city of Vienna bought it. It is worth 50 000 dollars. It disappeared again at the end of the Second World War. 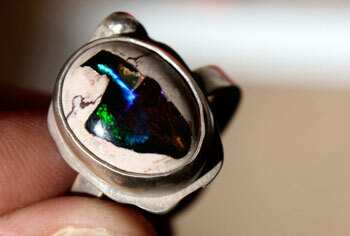 The aurora australis is considered as the most precious black opal. It is 180 cts. Mines: USA, Mexico, New Zealand, Czech Republic and Australia. the opal would guide one’s life. It increases creativity, inspiration, imagination and memory. It would be recommended to wear one when you give birth. It would limit some emotions such as anger and depression. the opal is the stone of change. It would act against allergies. It would purify the liver. It would avoid gallstones and would dissolve fibroma.